With unforgettable characters, a sweeping backdrop, and passionate storytelling, this is a fantasy debut to rival that of Robert Jordan. 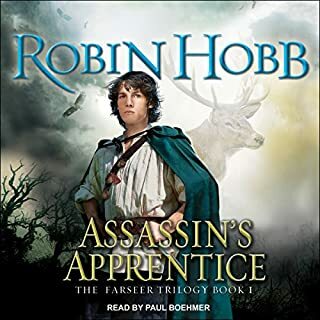 Filled with adventure and bloodshed, pageantry and piracy, mystery and menace, Assassin's Apprentice is the story of a royal house and the young man who is destined to chart its course through tempests of change. An orphan's life is harsh---and often short---in the island city of Camorr, built on the ruins of a mysterious alien race. 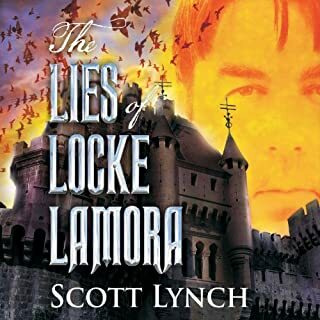 But born with a quick wit and a gift for thieving, Locke Lamora has dodged both death and slavery, only to fall into the hands of an eyeless priest known as Chains---a man who is neither blind nor a priest. A con artist of extraordinary talent, Chains passes his skills on to his carefully selected "family" of orphans---a group known as the Gentlemen Bastards. 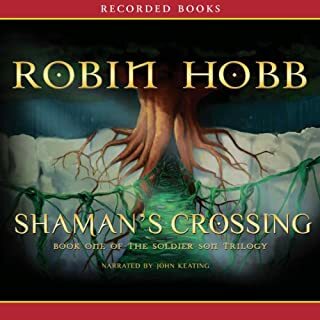 Hugo and Nebula Award finalist Robin Hobb crafts intricate fantasy tales featuring larger-than-life characters and exotic landscapes. Nevare Burvelle was born to be a soldier in the Gernian army. But as Nevare's career takes off, his worldview alters considerably. Corruption and nepotism reign, and now Nevare questions his own ideals, wondering why he continues fighting for the empire. After the War of the Gods, the demons were cast out and fell to the world. Mankind was nearly eradicated by the seemingly unstoppable beasts until the gods sent the great hero, Ramrowan, to save them. He united the tribes, gave them magic, and drove the demons into the sea. Ever since, the land has belonged to man, and the oceans have remained an uncrossable hell, leaving the continent of Lok isolated. This is a tale of sorrow, a tale of survival, a tale of one man's search for meaning in his universe, and how that search, and the indomitable will that drove it, gave birth to a legend. The Malazan Empire simmers with discontent, bled dry by interminable warfare, bitter infighting, and bloody confrontations with ancient and implacable sorcerers. Even the imperial legions, long inured to the bloodshed, yearn for some respite. Yet Empress Laseen’s rule remains absolute, enforced by her dreaded Claw assassins. For Sergeant Whiskeyjack and his squad of Bridgeburners, and for Tattersail, their lone surviving mage, the aftermath of the siege of Pale should have been a time to mourn the many dead. But Darujhistan, last of the Free Cities, yet holds out. Minalan gave up a promising career as a professional warmage to live the quiet life of a village spellmonger in the remote mountain valley of Boval. It was a peaceful, beautiful little fief, far from the dangerous feudal petty squabbles of the Five Duchies, on the world of Callidore. There were cows. Lots of cows. And cheese. For six months things went well. Then one night Minalan is forced to pick up his mageblade again to defend his adopted home from the vanguard of an army of goblins bent on a genocidal crusade against all mankind. And that was the good news. Terrific Book! 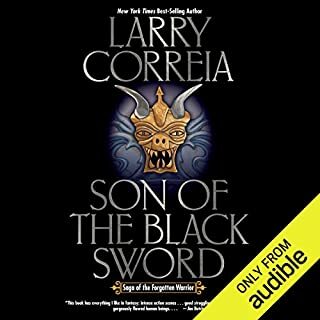 A great adult fantasy series. Sweeping from the majestic city of Ashoka to the perilous Wildness beyond her borders, enter a world where Caste determines mystical Talents, the purity of Jivatma expresses worth, and dharma may be based on a lie.Rukh Shektan has always understood duty. As a member of Caste Kumma, the warrior Caste, nothing else is acceptable. He is expected to take part in the deadly Trials, to journey the Wildness and protect the caravans linking Humanity's far-flung cities. Though the mission is dangerous, Rukh's hope and optimism are undaunted. Karma, however, is a fickle fiend. Great book and promising start to a new series. Logen Ninefingers, infamous barbarian, has finally run out of luck. Caught in one feud too many, he's on the verge of becoming a dead barbarian - leaving nothing behind him but bad songs, dead friends, and a lot of happy enemies. Nobleman, dashing officer, and paragon of selfishness, Captain Jezal dan Luthar has nothing more dangerous in mind than fleecing his friends at cards and dreaming of glory in the fencing circle. But war is brewing, and on the battlefields of the frozen North they fight by altogether bloodier rules. Characters drive the story. The Narrator rocks! Five years ago Corin Cadence's brother entered the Serpent Spire - a colossal tower with ever-shifting rooms, traps, and monsters. Those who survive the spire's trials return home with an attunement: a mark granting the bearer magical powers. According to legend, those few who reach the top of the tower will be granted a boon by the spire's goddess. He never returned. Now it's Corin's turn. He's headed to the top floor, on a mission to meet the goddess. Young Fitz, the illegitimate son of the noble Prince Chivalry, is ignored by all royalty except the devious King Shrewd, who has had him tutored him in the dark arts of the assassin. He has barely survived his first, soul-shattering mission, and when he returns to the court, he is thrown headfirst into the tumult of royal life. With the king near death, and Fitz's only ally off on a seemingly hopeless quest, the throne itself is threatened. Meanwhile, the treacherous Red Ship Raiders have renewed their attacks on the Six Duchies, slaughtering the inhabitants of entire seaside towns. In this time of great peril, it soon becomes clear that the fate of the kingdom may rest in Fitz's hands - and his role in its salvation may require the ultimate sacrifice. The problem with writing an entire book from a single perspective is that if the character fails to notice/understand something the reader does there is usually very little excuse for it besides stupidity/thickness. The reader possesses little or no outside knowledge but the character fails to make connections - this can become frustrating. Part of the problem is, I think, the reader (or perhaps the tone of the narrator, who is the main character but older) - it makes it hard to remember the character's age and lack of experience. That said, if you can keep your perspective this probably wont bother you too much. This book has a great deal of plot development, but manages to leave us completely up in the air as to what direction the next book will take. As many questions are answered as generated. The romantic angle is hit especially hard - I was expecting the typical cycle of "fall in love, discover its doomed, succeed despite the odds and live happily ever after" but its more like "fall in love, doomed, more doomed, miracle, seriously doomed, screw it we're doing it anyway, DOOM, all is lost, oh look there are other girls, oh wait maybe not..." - poor guy gets the rug pulled out from under him over and over and over. The romantic angle is never my favorite, but at least this one has some variation (and I'm pretty sure its 90% done with for this series). All in all this is a fairly massive setup for the third book, all the stages are set for something to happen - I just have no idea what. Would you say that listening to this book was time well-spent? Why or why not? I listened for the full 29+ hours. I could do so easily because Ms. Hobb is a good writer. The fantasy world she expertly crafted held my attention as i waited for the promising story to unfold, but it never really did. I like long form fantasy but holy crap the story should move a little. If you like a book that is 90% palace intrigue this is for you. If you think 29 hours of listening should be rewarded with story proggression you will be disappointed. The ending is surprising, but so is catching an STD from your spouse. Surprise does not always equal good and this one was a real dog. I bought two of her books on sale for $5.95 so I have another in this series waiting. The six bucks will easier to throw away that another 20+ hours of listening with no reward in the end. I am not sure if i will ever get around to listening to it. I have read the whole trilogy before (a few times) and enjoyed the books. 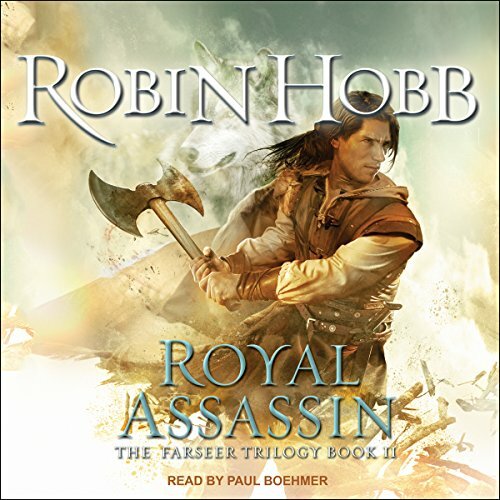 I definitely loved listening to the first two books of this series and hope that the third one also gets picked up by Audible. Fitz is so endearing to the listener that you cannot help but get lost in the story. The main characters whine and whine and whine and whine and OH. My. God! More whining! This series has such great potential which is why I even gave the second book a chance but there's hardly any intrigue, or action or anything other than a bunch of whining. The good stuff is in there but you have to slog through so much bitching and moaning and whining that it's hardly worth it. This series has been one of my favorites for years. I have read them over and over again. It is a joy to listen to one of my old favorites while doing chores around the house or cooking in the kitchen. The writing, to me, it beautiful, the characters poetically described. I love these books. BUT HERE'S THE THING! Nobody, and I mean, NOBODY, tells you to kill him. In fact, everyone says, for some reason, that killing him is the one thing you absolutely cannot do. Ever. Full stop. Even if, say, you're an incredibly skilled assassin and can make it seem like he died of dysentery, tuberculosis, a venereal disease, or (right, I can talk to animals) being mauled by a bear, YOU CAN'T KILL HIM JUST BECAUSE. BUT WAIT THERE'S MORE. Even though you, your friends, your king, your assassination teacher, the court jester and the horse trainer all KNOW that he deserves to die in a cosmic justice kind of sense, and they all KNOW that he NEEDS to die in a sort of "let's save the townfolk from becoming magic-pirate zombies" way, they SWEAR they'll betray every single one of your secrets or abandon you completely if you so much as raise a hand to the task. What's more is they keep asking you to save them from whatever dumb mistakes THEY'VE made in the past. So instead of saying, "Chill out, guys, I'll take the fall for this one. When the new prince takes power, he can pardon me of my crimes or whatever. Or he can exile me. No biggs," you go along with it. All of it. With only a minimal amount of frustration and anger. Simply a morose acceptance of "that's how things are." Tell me that this is the way things would actually go down. Do it. Tell me. I am OKAY with gritty realism in fantasy. I am OKAY with morally gray characters. I'm hip with Banks, KJ Parker, and Joe Abercrombie. I get it. I do. But when EVERY SINGLE CHARACTER on the side of good (which totally and unquestionably EXISTS in this tale) acts like a complete LOON. Well, then, you have given me ample reason to never finish this series. ... if you survived the sheer boredom of the first book then this one is a bit better. 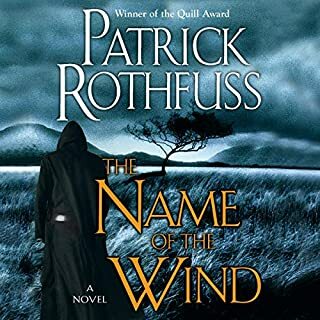 This series is WAY overrated, though, compared to almost all the others that appear in various 'best fantasy series' lists. Never have I encountered so much effort in a story for so little to happen. The greatest flaw is how unnaturally the characters behave in order to create tension and drama in the plot. It's like The Walking Dead in that way. The reading performance is slightly less foppish than the first book...so I guess it's got that going for it as well. Simply put: this story follows the tropes of other sequels. After building up and growing out the main characters in the first story, most authors must then create a new, unique challenge or else figure out how to take away the MC’s power. In this case, the author choose to take away everyone’s ability to make a logical/rational decision. The author’s choices intended to prolong and grow the climatic action left me agitated. I have rarely been as frustrated with main characters, who continued to make the same poor decisions in this book as the first. I wanted to root for a single character but in the end, they were too flawed and too incapable to find interesting (except the Wit, who I enjoyed reading about each time he showed up). Everyone got what they deserved. Hated it. wasn't worth getting through. I didn't find myself being interested in the plot at any moment.